This year I have been sucked into watching YouTube makeup artists doing tutorials, vlogs, product reviews etc. Even more so now that Halloween is around the corner and I wanted to share these awesome Halloween looks to die for… of course not literally, but I like the morbid theme in that title #sueme. I’ll start off with my favorite one which is the Gangster Clown that Chrisspy made recently. I was floored with the intro because I wasn’t sure if I was watching a movie or a tutorial. See for yourself in her video below. I liked the song so much I made it into my ringtone #sorrynotsorry. Can I just say that she has mad swag in this video? If I didn’t know any better I would have thought she’s a Chicana. What I really like about this one is how easy she makes it look. Out of all the looks, I think this one is perfect for beginners like me. Now if only I could find a blue wig like that, my life would be complete. I love Nicole Guerriero! She really surprised me with this Demented Fortune Teller tutorial and I really like it minus the blond wig. I always picture fortune tellers as brunettes or ladies with crazy silver hair if you know what I mean. The contacts are a nice touch too, though if I were to do this look I think I’ll forgo them because I want to be able to see. I think that’s important right? The veins underneath the eye remind me of a Vampire Diaries character about to munch down on an innocent townie. Since I love jewelry, no costume is ever complete with some serious bling. The rings are of course on point and the headband is to die! I actually have that belly dancer sarong or whatever is called. Actually my mom has it, but I know she won’t care and will let me borrow it. Can we talk about the nice touch with the gold on the lips? It seriously made my head spin because I love gold anything and to include that in a Halloween makeup look, pretty much knocked it out the park. 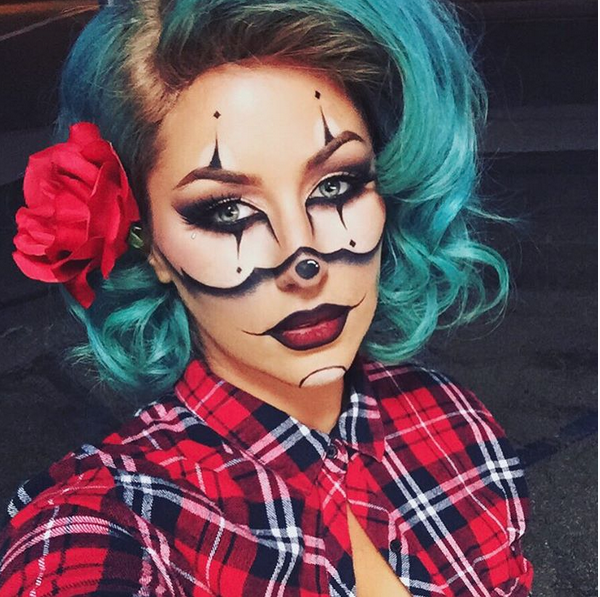 The beautiful and talented Desi Perkins aka Desimakeup hit the nail on the head with this American Horror Story Freak Show inspiration. I definitely dig the skull/clown combination because it makes it look like a skull and a clown had a baby, hence a freakshow! haha. Don’t mind me and go watch her mad skills go to town. I’m not sure if I will do any of these Halloween looks because although I know I can be creative, I know it will take lots of practice and I just want to do all three in one, but that will be too much right? People won’t be able to tell what the hell I am dressed up as so they’ll just say Bella is a freak and came for her treats. Which of these looks are you guys dying for? Tell me in the comments which one of these I should do because I think they are all awesome and I can’t decide.